As a self-confessed data nerd, my love of data comes from the insights it can provide. Depending on the topic, the insights can make a profound difference for organisations and the people it exists to serve (i.e. customers/clients). So, this data-love continues to drive my curiosity and desire to learn more about data gathering, data analytics and data storytelling. I have captured some of my thinking about key tips to keep in mind when approaching the collection and use of data individually, and as an organisation. If you think any are missing, please let me know. Data can tell many different stories – Communicate these in a clear way so audiences understand the impact of the insights – they can then appreciate data more deeply as a powerful driver for change and improvement. Invest in your team’s understanding of data – helping them appreciate what it means for the organisation will create opportunities for more data-informed decisions and collaborations. Use data across the organisation – it empowers individuals and teams to find efficiencies, opportunities, and successes in current practice, and generates excitement and collective ownership of what data can help organisations achieve. Encourage people to use data – get individuals and teams to identify and explore ways they can gather and use data. Create experiments to gather and use data in the workflow. Data’s power comes when it is used and shared – so, share it with others. Both your interpretation/story of the data, and the data itself. Colleagues may see something you have missed. Using data is everyone’s responsibility – not just the responsibility of technical experts. But find those who can help everyone else understand what the data means. Direct and Indirect data can help – data can be data gathered and observed directly as well as from other’s efforts to solve the same (or similar) problem. Not everything collected is data. If your collection process can be duplicated, duplicate it and test it. The quality of the data matters just as much as the quantity. Data is an asset – so treat it as such. Secure it and back it up. Often. Keep your problem clear in your mind – Data collection and analysis need to solve problems through data-informed decisions. Data-informed decisions can change – Whilst data helps make decisions, it doesn’t mean the decision is sacrosanct and can’t be modified or completely reversed if new data provides deeper and more effective insights. Leaders create the culture where the curious exploration with data, to help solve a problem and/or inform a decision, is encouraged and supported. 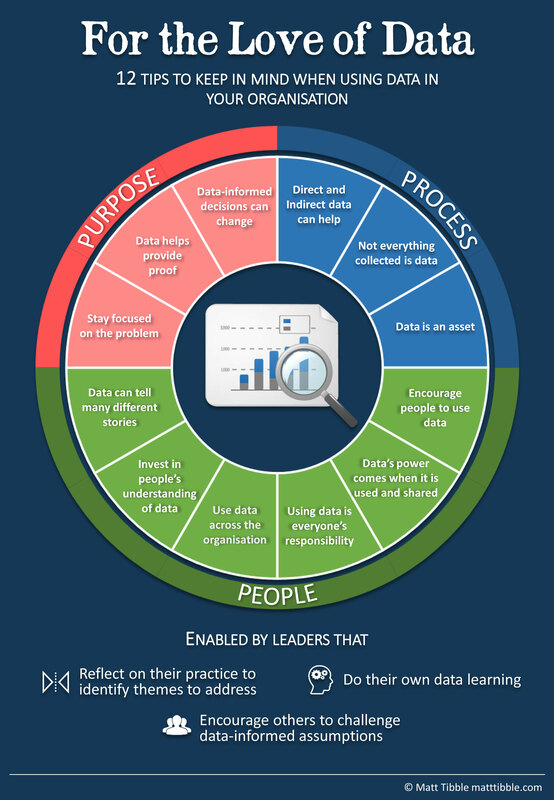 To do that, here are a couple of data-focused tips specifically for leaders. Reflection on your practice will identify themes you may wish to address. This is data. Embrace what you discover and experiment with making small changes. Do your own data learning. You don’t need to be a data guru but you do need to appreciate its importance and lead your teams in the use of data effectively. Encourage others to challenge data-informed assumptions. Be courageous in checking these assumptions to minimise any confirmation bias taking place either within a team or across the organisation. Posted in General, Leadership and tagged data, Experiment, leadership, learning.